The Tarot card for March and the last of this series is the Emperor. 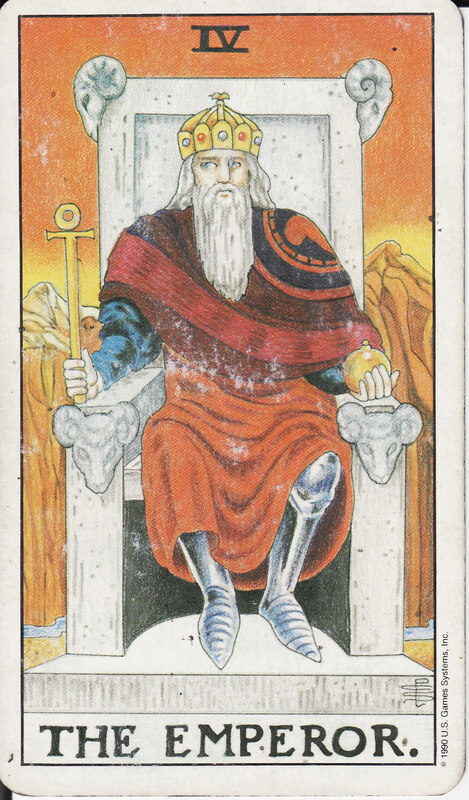 The Emperor is also referred to as The Father or Patriarch in other Tarot decks. The Emperor is the Fifth of the Major Arcana in Tarot. It is associated with the planet Mars, the element of fire, and Aries in the zodiac. The Emperor represents masculine power, structure, rules, and stability. The Emperor is a true pioneer and trailblazer who uses logic rather than intuition. This Tarot card is about self-control and discipline. As Mars energizes other planets in astrology, the Emperor establishes a firm foundation for the other Tarot cards. This card is depicts the Emperor as an elderly man with a long white beard dressed in armor, red robes, and a crown. The Emperor is seated on a stone throne with four rams heads carved into it. In his left hand is an orb and in his right is an Ankh. Behind him is a barren landscape. The Emperor's garb symbolizes that he is a leader and high social status. His white hair is representative of his wisdom and experience. The throne symbolizes authority and power. This theme is continued by the four rams heads; the Ram is also a symbol for Aries which is the astrological sign for this card. The number four is used as it is a number for stability. The orb is a common symbol for monarchs and rulers while the Ankh symbolizes life. The barren landscape symbolizes the discipline of the Emperor.